MARCO POLO ORTIGAS celebrates ALL THINGS SWISS from August 19 to September 4, 2016. Different gastronomic treats from chocolate to cheese and wine could be experienced at MARCO POLO ORTIGAS. 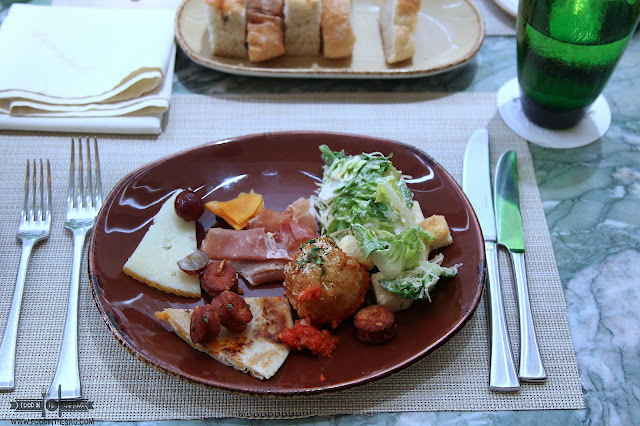 For their in house restaurant CUCINA, Swedish dishes are on hand to celebrate the experience. One could start off with the Raclette Cheese. CHEF ROLF JAEGGI serves and prepares the dish personally. He is a Swiss borne culinary expert that has a vast international experience. CUCINA guests would definitely welcome him with open arms and open mouths. After starting with cheese, the BEEF CARPACCIO with BEEF TARTAR would be the way to go. Served with a perfectly cooked quail egg, mache leaves and lemon pepper marinade, the flavors are all brought out. The freshness of the meat is spot on. TO warm up the appetite, the SWISS BARLEY SOUP is presented. Mixed with herbs and viande des grisons, this is very light. For the main, one could go for the VEAL ZURICHOISE with ROSTI POTATOES. The veal was tender and delightfully done. The Rosti is almost like hash browns but a bit more light and salty in a good way. For dessert, the PLUM TART with Vanilla snaps and whipped cream would be the right ending. Not too sweet and just right, the crisp gave it a different texture. Other diners need not worry as all the favorites are still present in the buffet. An assortment of fresh seafood are their for the picking. One could also go for the grilling station and have different skewers cooked. The meat section is also filled with prime rib and their cochinillo. Guests would also enjoy the freshly made pralines that are available at Cafe Pronto. What a perfect time to visit MARCO POLO ORTIGAS. "Monday to Thursday at Php 1,500 for lunch buffet and Php 1,800 for dinner buffet. Weekend rates for Friday to Sunday at Php 2,300 for lunch and Php 2,500 for dinner buffet. A Special gift from Turkish Airlines awaits lucky guests."